Set in an urban neighborhood off Commonwealth Avenue in Boston this building makes use of traditional proportions, varied massing, neo-classical roof style and detailed brick patterns to provide fifty-six condominium residences. Worked closely with neighborhood groups and Boston city agencies to achieve a high unit density compatible with traditional design values that would produce a quality design solution for the location. The interior of the building provides luxury amenities which accommodate a contemporary lifestyle. Extra large windows, private decks, fireplaces, and duplex floor plans enhance many of the units. 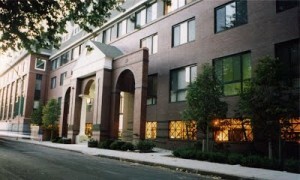 Common amenities include indoor parking, a marble and mahogany detailed two-story lobby, spacious roof deck, and fitness center with lap pool, saunas, and direct access to an adjacent squash and health club. Blending historical scale and detailing with current attitudes towards design, the building establishes a contemporary Boston architecture character for the neighborhood.